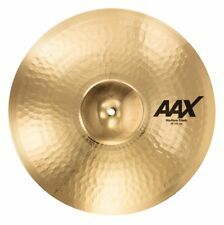 SABIAN 14" AAX X-Plosion Fast Crash Cymbal. Used Gear is sold as is. As with everything in life, we also have limits, here are a few. Due to "DNA" and other things;. Give us a call! Fees may apply . Smaller and lighter than its 22" cousin, the 19" XSR Monarch opens the door to a greater range of pitch to the Monarch family, with more crashable options. Like that amazing cymbal you found in a garage sale, you'll consider this a huge score. Once complete, they end up in the Vault for testing before receiving a stamp of approval. Sabian SBR Promotional Set Features. Each individual cymbal is placed on a shelf to age, allowing the frantically active molecules to slow down and stabilize. The Holy China is not for the faint of heart. SABIAN AA cymbals are all about classic sounds. It's about tradition, about what made history. And it's about making history again. SABIAN 17" AA Holy China Cymbal. Also available in AAX Modern Bright models. Until HHX, it was impossible to project darkness. It gets you heard. As with everything in life, we also have limits, here are a few. Due to "DNA" and other things;. The result is a darker, quicker effects crash with more white noise and more pure attack. won't do: We won't grab an unopened box off the shelf and send it to you, unchecked and unplayed. Won't do that. Crisp stick attack remains bright and audible, while light wash shines at higher volumes. 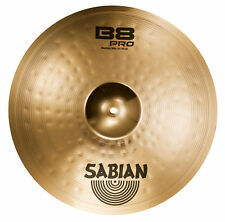 The Sabian 20" B8 Pro Medium Ride is the real deal in every sense! If speed, power and aggression describe the way you play, B8 Pro may be the cymbal series for you. With new larger hammering pattern and improved bell design, B8 Pro rocks harder than ever. Designed and crafted by the Sabian Vault team for players moving up in the world of quality Bronze cymbals, B8 Pro delivers way more for less..
Until HHX, it was impossible to project darkness. It gets you heard. As with everything in life, we also have limits, here are a few. Due to "DNA" and other things;. As with everything in life, we also have limits, here are a few. Due to "DNA" and other things;. For sale is a pair of Sabian XSR 14" X-Celerator Hi Hat Cymbals in New Condition. 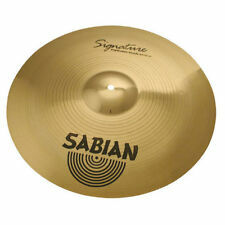 Included in the price is Sabian's factory 2 year warranty! We specialize in anything drum related from the early 1900's to the 1980's. 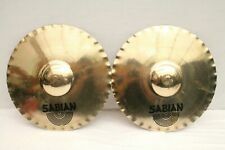 Sabian 13" Quiet Tone Hi-Hat Pair Practice Cymbal. Condition is New. Bought full set but did not need the Hi Hats. Perfect Condition. The Sabian HHX Evolution Splash cymbal was designed by Sabian with the help of Dave Weckl. Used Gear is sold as is. As with everything in life, we also have limits, here are a few. No exceptions. AAX Freq Hats are no exception. Get your FREQ on! Used Gear is sold as is. As with everything in life, we also have limits, here are a few. Here is a Sabian Paragon Flight Case. This case is from the Neil Peart Paragon Cymbal Series Set. It is a King Kong Kases case with the Sabian and Paragon logo on the top and bottom of the case. It is 24"x24"x7" and fits up to a 22" cymbal. SABIAN 14" AA APOLLO HATS Cymbal. Highly articulate. Super Fat. Yes, a pair of Hats can be all of the above, and AA Apollo Hats are proof. Stomp on them, and you’ll swear that magicians in the Sabian Vault built a mini-kick drum into the foot sound. A perfect first set for the serious and discerning beginner. Used Gear is sold as is. As with everything in life, we also have limits, here are a few. With its streamlined design and sound-shaping Auto-Focus Response feature, AAX is the ultimate breakthrough in modern cymbal making. Tap with your finger or thrash with a stick, Auto-Focus Response maximizes sensitivity, equalizes high & low pitch levels, and purifies sounds by filtering out conflicting overtones. 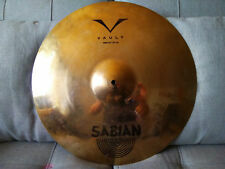 SABIAN HHX X-Treme Crash 17"
For sale is Sabian 22" HHX Groove Ride Prototype! Natural finish with a raw bell. Bell is cutting and clear! One of a kind cymbal! This has been on display so may have a few stick marks. See the pictures for more details! Fast, solid response for an explosion of bright tone for bigger, fuller accents. Excellent Condition. A few stick marks. SOUND: Bright. Sure, the band may hate you, but you know a good Tg when you hear it! Protected by SABIAN Two-Year Warranty.